Lord of the Rings: Is there any class conflict among Elves? Is There Class Conflict Among Elves in the Lord of the Rings Books? Elrond and Galadriel in the Lord of the Rings movies. Photo illustration by Slate. Film stills via New Line Cinema. Yes, Galadriel and Elrond Peredhil overthrew the elven monarchy. Though not an attempt per se to overthrow the elven monarchy, it was an attempt to unilaterally change the rules by which the monarchy existed, at least as it had been established by the Valar (under which upon the death of the king, his eldest son became king). Like it or not, Fëanor was the eldest son of Finwë, who had been acknowledged for millennia as the rightful High King of the Noldor. Galadriel was the eldest surviving Noldorin elf in Middle-earth, and she had the most direct royal bloodline tracing back through her father, Finarfin, who was the son of Finwë, the original High King of the Noldor. Galadriel could rightfully have chosen to assert her claim to the High Queenship of the Noldor in Middle-earth. Yet she merely contented herself with the title Guardian of Lothlórien. Elrond Peredhil was the eldest male Noldorin elf with a direct bloodline to Finwë via a former High King of the Noldor through his father, Eärendil, whose mother, Idril, was the daughter of Turgon, who was High King of the Noldor (albeit only after the deaths of Finwë, Fëanor, Fingolfin, and Fingon). Elrond could rightfully have chosen to assert his claim to the High Kingship of the Noldor in Middle-earth. Yet Elrond merely contented himself with the title Lord of Rivendell. 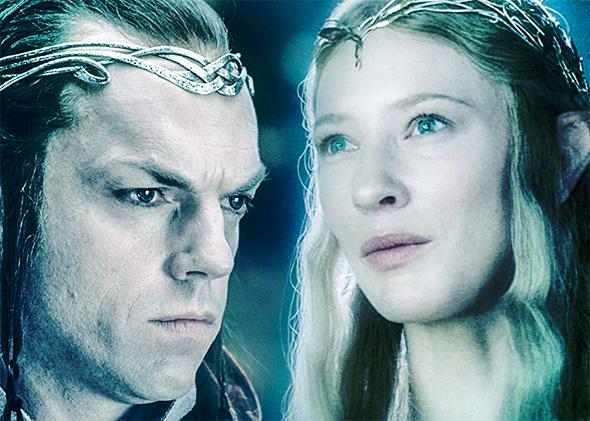 The fact that neither Galadriel nor Elrond chose to assume the High Queenship/Kingship of the Noldor in Middle-earth, while not an act of “class conflict,” can be viewed as the political overthrow of the elven monarchy. Read more on why neither Galadriel nor Elrond claimed the vacant High Kingship of the Noldor. Tolkien’s Middle Earth: If evil cannot create things in Tolkien’s mythology, how did Melkor create dragons? The Lord of the Rings: Of all of Tolkien’s characters, who was the single most tragic figure, and why? Elves (Tolkien’s universe): Why does Thranduil have the title “King”, while Elrond is “Lord” and Galadriel is “Lady”?